These stripes heels are so adorable! Love this look! I love this outfit! The stripes on stripes are perfection. Is that a Tory Burch bracelet? I would love to see a link to that! Classy and casual outfit! 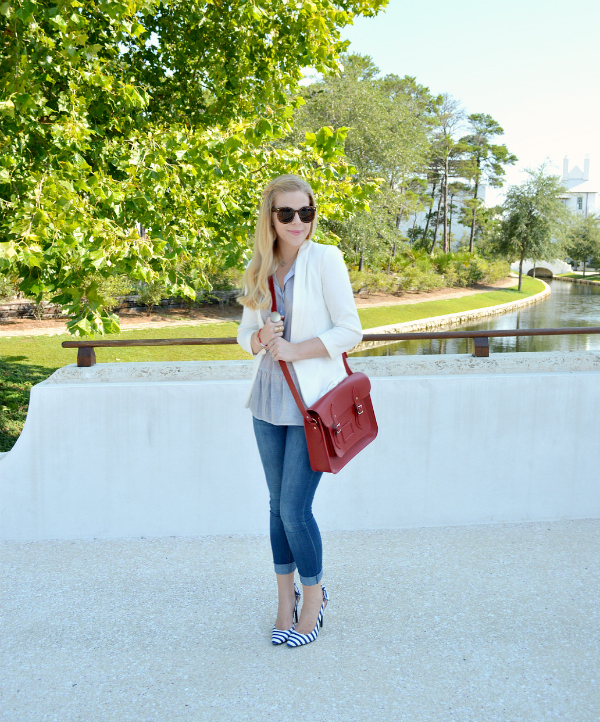 Great blazer and bag! I'm feeling completely obsessed about your shoes, so beautiful and versatile, that perfect tchanan touch to any outfit. really loving that shirt, that bag, and those bracelets. such a wonderful, almost nautical feel without being too overbearing! Those striped heels are fab! I wouldn't think to wear stripes on stripes but it's a lovely look on you! I adore those shoes. Love the classic color combo! very cute! I love the detail of your shoes and that bag is amazing! I love the structure of your blazer and that necklace, too cute! Such a great look, you look fantastic and I'm loving those unique bracelets! Beautiful styling! I say yes to this entire outfit ! 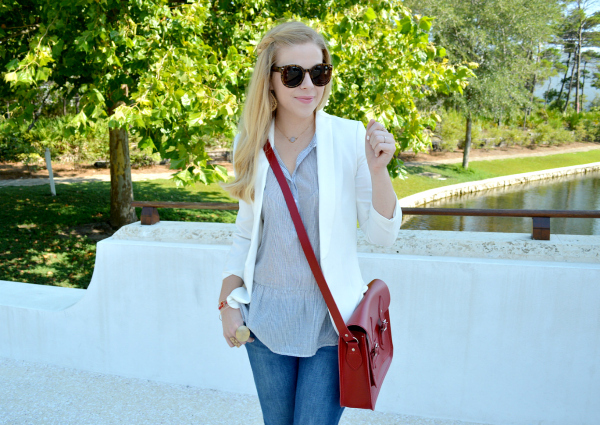 Love that colorful satchel! This is the perfect summertime outfit! Adore those heels. You look amazing. Those heels are too cute!! I almost bought a pair very similar from Zara, now I'm wishing I did! Maybe I'll have to check out the DSW ones first! Such a pretty all-american girl! 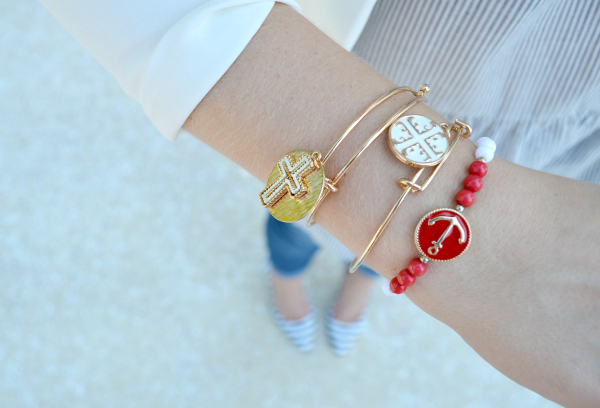 :) The anchor bracelet is cool. How precious! I love the striped heels and the dainty bracelets! So beautiful!!!!! Love the H&M handbag. The color is to die for!! Just amazing!! Love the striped heels too! In LOVE with these shoes! That dainty necklace is so pretty. Great look girl!! Pretty I love the red and white. 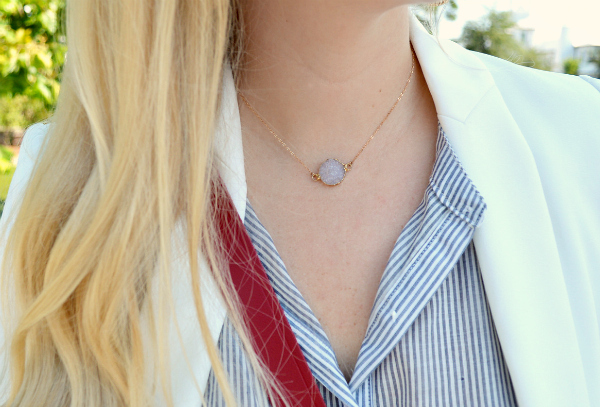 I absolutely love this cute, delicate necklace! So pretty! Love love love those shoes. I'm such a sucker for blue and white stripes! This is so cute! 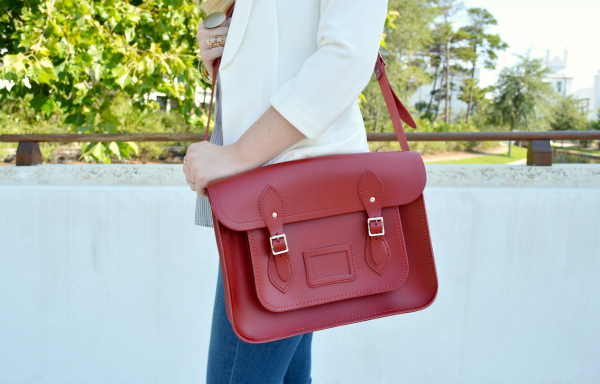 I LOVE Cambridge Satchel bags. So fun!